Dirk Werner Nowitzki (German pronunciation: [ˈdɪʁk ˈvɛʁnɐ noˈvɪtski]) (born June 19, 1978) is a German former professional basketball player. An alumnus of Röntgen Gymnasium and the DJK Würzburg basketball club, Nowitzki was chosen as the ninth pick in the 1998 NBA draft by the Milwaukee Bucks and was immediately traded to the Dallas Mavericks, where he had played his entire 21-year National Basketball Association (NBA) career. In the NBA, he won the league Most Valuable Player (MVP) award in 2007, was an NBA champion in 2011, and was a 14-time All-Star. Listed at 7 ft 0 in (2.13 m), Nowitzki is considered one of the greatest power forwards of all time. Nowitzki has led the Mavericks to 15 NBA playoff appearances (2001–2012; 2014–2016), including the franchise's first Finals appearance in 2006 and its only NBA championship in 2011. Known for his scoring ability, his versatility, his accurate outside shooting, and his trademark fadeaway jump shot, Nowitzki won the NBA Most Valuable Player Award in 2007 and the NBA Finals Most Valuable Player Award in 2011. Nowitzki's NBA career has been filled with accomplishments. He is the only player ever to play for a single franchise for 21 seasons. Nowitzki is a 14-time All-Star, a 12-time All-NBA Team member, the first European player to start in an All-Star Game, and the first European player to receive the NBA Most Valuable Player Award. Nowitzki is the highest-scoring foreign-born player in NBA history. He is the first Maverick voted onto an All-NBA Team and holds several all-time Mavericks franchise records. On December 10, 2012, he became the first non-American player to receive the Naismith Legacy Award. As of March 18, 2019, Nowitzki stood sixth on the list of National Basketball Association career scoring leaders. Nowitzki's career in international play is also noteworthy. He led the German national basketball team to a bronze medal in the 2002 FIBA World Championship and silver in EuroBasket 2005, and was the leading scorer and MVP in both tournaments. Born in Würzburg, Germany, Dirk Werner Nowitzki comes from an athletic family: his mother Helga Nowitzki (née Bredenbröcker) was a professional basketball player and his father Jörg-Werner was a handball player who represented Germany at the highest international level. His older sister Silke Nowitzki, a local champion in track and field, also became a basketball player and now works for the NBA in International TV. Nowitzki was a very tall child; most of the time he stood above his peers by a foot or more. He initially played handball and tennis, but soon grew tired of being called a "freak" for his height and eventually turned to basketball. After joining the local DJK Würzburg, the 15-year-old attracted the attention of former German international basketball player Holger Geschwindner, who spotted his talent immediately and offered to coach him individually two to three times per week. After getting both the approval of Nowitzki and his parents, Geschwindner put his student through an unorthodox training scheme: he emphasized shooting and passing exercises, and shunned weight training and tactical drills, because he felt it was "unnecessary friction". Furthermore, Geschwindner encouraged Nowitzki to play a musical instrument and read literature to make him a more complete personality. After a year, the coach was so impressed with Nowitzki's progress that he advised him, "You must now decide whether you want to play against the best in the world or just stay a local hero in Germany. If you choose the latter, we will stop training immediately, because nobody can prevent that anymore. But if you want to play against the best, we have to train on a daily basis." After pondering this lifetime decision for two days, Nowitzki agreed to enter the full-time training schedule, choosing the path to his eventual international career. Geschwindner let him train seven days a week with DJK Würzburg players and future German internationals Robert Garrett, Marvin Willoughby, and Demond Greene, and in the summer of 1994, then 16-year-old Nowitzki made the DJK squad. When Nowitzki joined the team, DJK played in Germany's 2nd-tier level league, the Second Bundesliga, South Division. His first trainer was Pit Stahl, who played the tall teenager as an outside-scoring forward rather than an inside-scoring center to utilise his shooting skills. In the 1994–95 Second Bundesliga season, ambitious DJK finished as a disappointing sixth of 12 teams; the rookie Nowitzki was often benched and struggled with bad school grades, which forced him to study rather than work on his game. In the next 1995–96 Second Bundesliga season, Nowitzki established himself as a starter next to Finnish star forward Martti Kuisma and soon became a regular double-digit scorer: after German national basketball coach Dirk Bauermann saw him score 24 points in a DJK game, he stated that "Dirk Nowitzki is the greatest German basketball talent of the last 10, maybe 15 years." In the 1996–97 Second Bundesliga season, Nowitzki averaged 19.4 points per game and led DJK again to second place after the regular season, but could not help his team gain promotion. In the following 1997–98 Second Bundesliga season, Nowitzki finished his "Abitur" (German A-levels), but had to do compulsory military service in the Bundeswehr which lasted from September 1, 1997 to June 30, 1998; The 18-year-old, who had grown to 6 ft 11 in (2.11 m) tall, made progress, leading DJK to a 36:4-point total (in Germany, a victory gives 2:0 points and a loss 0:2) and ending as leading scorer with 28.2 points per game. In the promotion playoffs, DJK finally broke its hex, finishing at first place with 14:2 points and earning promotion to the next higher league; Nowitzki was voted "German Basketballer of the Year" by the German BASKET magazine. Abroad, Nowitzki's progress was noticed. A year later, the teenager participated in the Nike "Hoop Heroes Tour", where he played against NBA stars like Charles Barkley and Scottie Pippen. In a 30-minute show match, Nowitzki outplayed Barkley and even dunked on him, causing the latter to exclaim: "The boy is a genius. If he wants to enter the NBA, he can call me." On March 29, 1998, Nowitzki was chosen to play in the Nike Hoop Summit, one of the premier talent watches in U.S. men's basketball. In a match between the U.S. talents and the international talents, Nowitzki scored 33 points on 6-of-12 shooting, 14 rebounds and 3 steals for the internationals and outplayed future US NBA players Rashard Lewis and Al Harrington. He impressed with a combination of quickness, ball handling, and shooting range, and from that moment a multitude of European and NBA clubs wanted to recruit him. Projected to be seventh pick in the 1998 NBA draft, Nowitzki passed up many college offers and went directly into the NBA as a prep-to-pro player. The Milwaukee Bucks selected Nowitzki with the ninth pick in the draft and traded him to the Dallas Mavericks in a multi-team deal; future star point guard Steve Nash came to Dallas in the same trade. Nowitzki and Nash quickly became close friends. Nowitzki became only the fourth German player in NBA history, following pivots Uwe Blab and Christian Welp and All-Star swingman Detlef Schrempf, who was a 35-year-old veteran of the Seattle SuperSonics when his young compatriot arrived. Nowitzki finished his DJK career as the only Würzburg player to have ever made the NBA. In Dallas, Nowitzki joined a franchise which had last made the playoffs in 1990. Shooting guard Michael Finley captained the squad, supported by 7-foot-6-inch (2.29 m) center Shawn Bradley (once a number two draft pick) and team scoring leader Cedric Ceballos, an ex-Laker forward. The start of the season was delayed by the 1998–99 NBA lockout, which put the entire season in jeopardy. In limbo, Nowitzki returned to DJK Würzburg and played thirteen games before both sides worked out a late compromise deal that resulted in a shortened NBA schedule of only 50 games. When the season finally started, Nowitzki struggled. Played as a power forward by coach Don Nelson, the 20-year-old felt overpowered by the more athletic NBA forwards, was intimidated by the expectations as a number nine pick, and played bad defense; hecklers taunted him as "Irk Nowitzki", omitting the "D" which stands for "defense" in basketball slang. He only averaged 8.2 points and 3.4 rebounds in 20.4 minutes of playing time. Looking back, Nowitzki said: "I was so frustrated I even contemplated going back to Germany. ... [the jump from Second Bundesliga to the NBA] was like jumping out of an airplane hoping the parachute would somehow open." The Mavericks only won 19 of their 50 games and missed the playoffs. On January 4, 2000, team owner Ross Perot, Jr. sold the Mavericks to Internet billionaire Mark Cuban for $280 million. Cuban quickly invested into the Mavericks and restructured the franchise, attending every game at the sidelines, buying the team a $46 million six-star Boeing 757 to travel in, and increasing franchise revenues to over $100 million. Nowitzki lauded Cuban, stating that he "created the perfect environment... we only have to go out and win." As a result of Nelson's tutelage, Cuban's improvements and his own progress, Nowitzki significantly improved in his second season. Nowitzki averaged 17.5 points, 6.5 rebounds and 2.5 assists per game in 35.8 minutes. He was voted runner-up in the NBA Most Improved Player Award behind Jalen Rose, and made it into the NBA All-Star Sophomore squad. The 7-foot-0-inch (2.13 m) Nowitzki also was chosen for the NBA All-Star Three Point Shootout, becoming the tallest player ever to participate. While he improved on an individual level, the Mavericks missed the playoffs after a mediocre 40–42 season. In the 2000–01 NBA season, Nowitzki further improved his averages, recording 21.8 points, 9.2 rebounds, and 2.1 assists per game. As a sign of his growing importance, he joined team captain Finley as only one of two Mavericks to play and start in all 82 games, and had 10 games in which he scored at least 30 points. Nowitzki became the first Maverick ever to be voted into the All-NBA squads, making the Third Team. In addition, his best friend Nash became a valuable point guard, and with Finley scoring more than ever, pundits took to calling this trio the "Big Three" of the Mavericks. Posting a 53–29 record in the regular season, the Mavericks reached the playoffs for the first time since 1990. As the fifth seed, they were paired against the Utah Jazz, who were led by point guard John Stockton and power forward Karl Malone. The Mavericks won the series in five games, setting up a meeting with their Texas rivals, the San Antonio Spurs. The Mavericks lost the first three games of the series, and Nowitzki fell ill with the flu and later lost a tooth after a collision with Spurs guard Terry Porter. After a Game 4 win, Nowitzki scored 42 points and grabbed 18 rebounds in Game 5, but could not prevent a deciding 105–87 loss. Prior to the 2001–02 NBA season, Nowitzki signed a six-year, $90 million contract extension, which made him the second-highest-paid German athlete after Formula One champion Michael Schumacher. He continued to improve, averaging 23.4 points, 9.9 rebounds and 2.4 assists per game. Nowitzki was voted into the All-NBA Second Team and into his first All-Star Game. After making the playoffs with a 57–25 record, the Mavericks swept Kevin Garnett and the Minnesota Timberwolves in the first round; Nowitzki averaged 33.3 points per game. In the second round, the Mavericks met the Sacramento Kings and rival power forward Chris Webber. After splitting the first two games, Kings coach Rick Adelman changed his defensive scheme, assigning Hedo Türkoğlu to cover Nowitzki. Türkoğlu would use his agility to play Nowitzki tightly, and if the taller Maverick tried to post up Türkoğlu, Webber would double team Nowitzki. In Game 3 in Dallas, the Mavericks lost, 125–119; Nowitzki scored only 19 points and said: "I simply could not pass Türkoğlu, and if I did, I ran into a double team and committed too many turnovers." In Game 4, Nowitzki missed two potentially game-deciding jump shots, and the Mavericks lost, 115–113, at home. In Game 5, the Mavericks were eliminated, 114–101. However, Nowitzki received a consolation award: the Gazzetta dello Sport voted him as "European Basketballer of the Year", his 104 votes lifting him over second-placed Dejan Bodiroga (54) and Stojakovic (50). Before the 2002–03 NBA season, Don Nelson and Mark Cuban put more emphasis on defense, specializing in a zone anchored by prolific shotblockers Raef LaFrentz and Shawn Bradley. 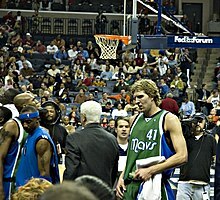 The Mavericks won their first eleven games, and Finley, Nash and Nowitzki were voted "Western Conference Players of the Month" in November 2002. In that season, Nowitzki lifted his averages again, now scoring 25.1 points, 9.9 rebounds and 3.0 assists per game. 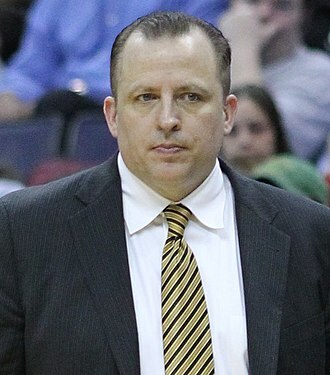 He led the Mavericks to a franchise-high 60–22 record, which earned them the third seed: as a result, the Mavericks had to play sixth seed Portland Trail Blazers in the 2003 NBA Playoffs. Now playing in a best-of-seven series instead of the former best-of-five, the Mavericks quickly won the first three games, but then completely lost their rhythm and the next three. In Game 7, Nowitzki hit a clutch three to make it 100–94 with 1:21 left and the Mavericks won 107–95. "This was the most important basket of my career", he later said, "I was not prepared to go on vacation that early." In the next round, the Mavericks met the Kings again, and the series went seven games. Nowitzki delivered a clutch performance in Game 7; he scored 30 points, grabbed 19 rebounds, and played strong defense, leading the Mavericks to a series-deciding 112–99 win. In the Western Conference Finals, the Mavericks met the Spurs again. In Game 3, Nowitzki went up for a rebound and Spurs guard Manu Ginóbili collided with his knee, forcing him out of the series. Without their top scorer, the Mavericks ultimately lost in six games. After Dallas traded starting center Raef LaFrentz to Boston for forward Antoine Walker, Nelson decided to start Nowitzki at center. To cope with his more physical role, Nowitzki put on 20 lb (9.1 kg) of muscle mass over summer, sacrificed part of his agility, and put more emphasis on defense rather than scoring. Nowitzki's averages fell for the first time in his career, dropping to 21.8 points, 8.7 rebounds and 2.7 assists per game, but he still led the Mavericks in scoring, rebounding, steals (1.2 spg) and blocks (1.35 bpg). These figures earned him nominations for the All-Star Game and the All-NBA Third Team. Compiling a 52–30 record, the Mavericks met their familiar rivals the Sacramento Kings in the playoffs once again, but were eliminated in five games. Nowitzki (#41) has been the face of the Mavericks franchise from 2004 to 2019. Before the 2004–05 NBA season, the Mavericks were re-tooled again. Center Erick Dampier was acquired from the Golden State Warriors in an eight-player trade. Also, Nowitzki's close friend and fellow international teammate Steve Nash left Dallas and returned to the Phoenix Suns as a free agent, going on to win two Most Valuable Player awards with the Suns. During the season, long-time head coach Don Nelson resigned, and his assistant Avery Johnson took on head coaching duties. In the midst of these changes, Nowitzki stepped up his game and averaged 26.1 points a game (a career high) and 9.7 rebounds; and his 1.5 blocks and 3.1 assists were also career-high numbers. On December 2, 2004, Nowitzki scored 53 points in an overtime win against the Houston Rockets, a career best. Nowitzki was voted to the All-NBA First Team for the first time. He also placed third in the league's MVP voting, behind Nash and Shaquille O'Neal. However, the Mavericks had a subpar 2005 NBA Playoffs campaign. In the first round, Dallas met Houston Rockets scoring champion Tracy McGrady and 7 ft 6 in (2.29 m) center Yao Ming. The Rockets took a 2–0 series lead before the Mavericks won three games in a row. After losing Game 6, Dallas won Game 7 convincingly and won the series even though Nowitzki struggled with his shooting. In the Western Conference Semi-finals, the Mavericks met the Phoenix Suns, the new club of Nash. They split the first four games before the Suns won the last two games. In Game 6, which the Mavericks lost in overtime, Nowitzki was not at his best: he scored 28 points, but also sank only 9 of his 25 field goal attempts and missed all five of his shots in overtime. Prior to the 2005–06 NBA season, veteran Mavericks captain Michael Finley was waived, leaving Nowitzki as the last player remaining from the Mavericks' "Big Three" of Nash, Finley, and himself. Nowitzki averaged 26.6 points, 9.0 rebounds, and 2.8 assists during the season. Not only was this his third 2,000-point season, but his scoring average of 26.6 points was highest ever by a European. He improved his shooting percentage, setting personal season records in field goals (48.0%), three-point shots (40.6%) and free throws (90.1%). During the 2006 All-Star Weekend in Houston, Nowitzki scored 18 points to defeat Seattle SuperSonics guard Ray Allen and Washington Wizards guard Gilbert Arenas in the Three-Point Shootout contest. Nowitzki paced Dallas to a 60-win season. The team finished with the third-best record in the league behind the defending champion San Antonio Spurs and the defending Eastern Conference champion Detroit Pistons. As in the 2004–05 season, he finished third in the league's MVP voting, this time behind Nash and LeBron James. He was again elected to the first team All-NBA squad. Nowitzki averaged 27.0 points, 11.7 rebounds, and 2.9 assists in the playoffs. 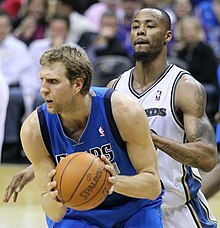 In the opening round, the Mavericks swept the Memphis Grizzlies, 4–0, with Nowitzki making a clutch three-pointer in the closing seconds of Game 3 which tied the game and forced overtime. In the Western Conference Semi-finals, the Mavericks played against the San Antonio Spurs again. After splitting the first six games, the Mavericks took a 20-point lead in Game 7 before Spur Manu Ginóbili broke a tie at 101 by hitting a 3 with 30 seconds left. On the next play, Nowitzki completed a three-point play, which tied the game at 104. In the end, the Mavericks won, 119–111, and Nowitzki ended the game with 37 points and 15 rebounds. Nowitzki commented: "I don't know how the ball went in. Manu hit my hand. It was a lucky bounce." The Mavericks advanced to the Western Conference Finals, where they again met the Suns. Nowitzki scored 50 points to lead the Mavericks to a victory in the crucial Game 5 with the series tied at 2; the Mavericks won the series in six games and faced the Miami Heat in the 2006 NBA Finals. A content Nowitzki commented: "We've been a good road team all season long, we believed in each other. We went through some ups and downs this season, but the playoffs are all about showing heart and playing together." Of Nowitzki's performance, ESPN columnist Bill Simmons wrote, "Dirk is playing at a higher level than any forward since [Larry] Bird." The Mavericks took an early 2–0 Finals lead, but then gave away a late 15-point lead in a Game 3 loss. Nowitzki only made 20 of his last 55 shots in the final three games as the Mavericks lost the Finals series, 4–2, to the Heat. The German was criticized by ESPN as "clearly ... not as his best this series" and remarked: "That was a tough loss (in Game 3) and that really changed the whole momentum of the series." In the 2006–07 season, Nowitzki shot a career-best 50.2% from the field, recorded averages of 24.6 points, 8.9 rebounds, and 3.4 assists, and led the Mavericks to a franchise-high 67 wins and the first Western Conference seed in the 2007 NBA Playoffs. He averaged 50% from the field, 40% for three-pointers, and 90% from the free throw line, becoming (at the time) only the fourth player in NBA history to join the 50–40–90 club. Nowitzki was touted as the overwhelming favorite for the Most Valuable Player award and was expected to lead the Mavericks to an easy win against the eighth-seed Golden State Warriors, despite the Warriors having won all three regular-season meetings against Dallas. However, the Mavericks ended up losing to the Warriors in six games, marking the first time a No. 8 seed had beaten the No. 1 seed in a best-of-seven series in NBA history. In the clinching Game 6, Nowitzki shot just 2–13 from the field for only eight points. Defended by Stephen Jackson, Nowitzki averaged nearly five points less than his regular-season average in that series and shot 38.3% from the field as compared to 50.2% during the regular season. He described that loss as a low point in his career: "This series, I couldn't put my stamp on it the way I wanted to. That's why I'm very disappointed." In spite of this historic playoffs loss, Nowitzki was named the NBA's regular-season Most Valuable Player and beat his friend and back-to-back NBA MVP Nash with more than 100 votes. He also became the first European player in NBA history to receive the honor. The 2007–08 campaign saw another first-round playoff exit for Nowitzki and the Mavericks. Despite a mid-season trade that brought veteran NBA All-Star Jason Kidd to Dallas, the Mavericks finished seventh in a highly competitive Western Conference. Nowitzki averaged 23.6 points, 8.6 rebounds, and a career-high 3.5 assists for the season. In the playoffs, they faced rising star Chris Paul's New Orleans Hornets, and were eliminated in five games. The playoff loss led to the firing of Avery Johnson as head coach and the eventual hiring of Rick Carlisle. The few positive highlights that season for Nowitzki were his first career triple-double against the Milwaukee Bucks on February 6, 2008, with 29 points, 10 rebounds, and a career-high 12 assists, and on March 8, 2008 (34 points against the New Jersey Nets), when he surpassed Rolando Blackman with his 16,644th point to become the Mavericks' all-time career points leader. The Mavericks finished the 2009–10 NBA season as the second seed for the 2010 NBA Playoffs. Notable additions to the squad were multiple All-Stars Shawn Marion and Caron Butler, with the latter coming in the second half of the season. On January 13, 2010, Nowitzki became the 34th player in NBA history—and the first European—to hit the 20,000-point milestone, while ending the regular season with averages of 25 points, 7.7 rebounds, 2.7 assists, and 1 block. He was selected to the 2010 All-Star Game, his ninth appearance. The Mavericks faced off against San Antonio once more in the first round of the playoffs, but for the third time in four seasons, they failed to progress to the next round. Nowitzki became a free agent after the season, but signed a four-year, $80 million deal to remain in Dallas. Prior to the 2010–11 season, the Mavericks traded for center Tyson Chandler. Nowitzki was injured in the middle of the season, but finished the regular season with averages of 23 points, 7 rebounds, and 3 assists. Despite missing nine games, Nowitzki was selected to the All-Star Game for the tenth time. The Mavericks defeated Portland in the first round of the playoffs and swept the two-time defending champion Lakers in the semifinals. In the Conference Finals, they faced the Oklahoma City Thunder and their All-NBA duo of Kevin Durant and Russell Westbrook. In Game 1, Nowitzki scored 48 points and set an NBA record of 24 consecutive free throws made in a game as well as a record for most free throws in a game without a miss. In Game 4, with Dallas leading the series 2–1, Nowitzki scored 40 points to rally his team from a 99–84 fourth-quarter deficit to a 112–105 overtime victory. Dallas won the Western Conference title in Game Five. In the 2011 NBA Finals, Dallas once again faced the Miami Heat, which had acquired All-Stars LeBron James and Chris Bosh before the season began. During a Game 1 loss in Miami, Nowitzki tore a tendon in his left middle finger; however, MRIs were negative, and Nowitzki vowed that the injury would not be a factor. In Game 2, he led a Dallas rally from an 88–73 fourth-quarter deficit, making a driving left-handed layup over Bosh to tie the series at 1. Miami took a 2–1 series lead after Nowitzki missed a potential game-tying shot at the end of Game 3. Despite carrying a 101 °F (38 °C) fever in Game 4, he hit the winning basket to tie the series yet again at 2, evoking comparisons to Michael Jordan's "Flu Game" against Utah in the 1997 NBA Finals. Dallas went on to win the next two games, with Nowitzki scoring 10 fourth-quarter points in the series-clinching game in Miami. The championship was the first in the history of the franchise. Nowitzki was named NBA Finals Most Valuable Player. As Dallas celebrated their title, the NBA was in a lockout that ended on December 8, 2011. The defending champions lost core players, such as DeShawn Stevenson, J. J. Barea, Peja Stojaković, and Tyson Chandler, while adding Lamar Odom, Delonte West, and veteran all-star Vince Carter in free agency. The Mavericks played only two preseason games, which led to a slow start for Nowitzki. Nowitzki made his 11th straight All-Star game appearance in Orlando. Nowitzki led his team in scoring 45 times during the season. Nowitzki's streak of 11 seasons with 1,500 points came to an end after scoring 1,342 in the shortened NBA season. Dallas clinched the seventh spot in the West, and were matched against the Oklahoma City Thunder in the 2012 NBA Playoffs. The Thunder swept the Mavericks in four games. Before the season, Jason Kidd and Jason Terry left the Mavericks in free agency. Nowitzki underwent knee surgery in October 2012 and missed the first 27 games of the season. He returned on December 23, 2012, in a game against San Antonio. In January 2013, Nowizki and some of his teammates made a pact not to shave their beards until the team reached .500. They were often called "The Beard Bros." On April 14, 2013, after a fadeaway jumper in a game against the New Orleans Hornets, Nowitzki became the 17th player in NBA history to score 25,000 points. The Mavs went on to win the game and climbed back to .500 with a 40–40 record, and Nowitzki shaved his beard. However the Mavericks missed the playoffs for the first time since Nowitzki's second season, ending their 12-year playoff streak. On January 29, 2014, Nowitzki scored his 26,000th point in a 115–117 loss to the Houston Rockets. In 35 minutes of play, he recorded 38 points, 17 rebounds, and 3 assists. On March 12, 2014, in a 108–101 victory over the Utah Jazz, Nowitzki finished the game with 31 points and passed John Havlicek on the NBA scoring list with 26,426 points. On April 8, 2014, Nowitzki scored his 26,712th point, passing Oscar Robertson to move to the 10th position on the all-time scoring list. Nowitzki led the Mavericks back to the playoffs where they faced their in-state rival San Antonio Spurs in the first round. Dallas lost the series in seven games, and the Spurs went on to win the NBA championship. On July 15, 2014, Nowitzki re-signed with the Mavericks to a reported three-year, $25 million contract. He was also reunited with former championship teammate Tyson Chandler, who was traded to Dallas after a three-year stint with New York. However, longtime teammate Shawn Marion signed with the Cleveland Cavaliers before the season. On November 11, 2014, Nowitzki scored 23 points to surpass Hakeem Olajuwon as the highest-scoring player born outside the United States, as the Mavericks came from 24 points down to defeat Sacramento, 106–98. Nowitzki hit a jumper from just inside the three-point line early in the fourth quarter to pass Olajuwon at No. 9, and he finished the night at 26,953 career points. Six days later, Nowitzki became the fourth player in NBA history to eclipse 27,000 career points with the same franchise, joining Michael Jordan, Karl Malone and Kobe Bryant. On December 26 against the Los Angeles Lakers, Nowitzki passed Elvin Hayes for eighth place on the NBA's all-time scoring list. He went on to pass Moses Malone for seventh place on the NBA's all-time scoring list on January 5, 2015 in a 96–88 overtime win over the Brooklyn Nets. He recorded his 10,000th career rebound on March 24 against the San Antonio Spurs, and scored his 28,000th career point on April 1 against the Oklahoma City Thunder. The Mavericks finished the regular season as the No. 7 seed in the Western Conference with a record of 50–32. They faced the Houston Rockets in the first round of the playoffs and lost the series in five games. On November 11, 2015, Nowitzki scored a season-high 31 points in a 118–108 win over the Los Angeles Clippers. He also grabbed a team-high 11 rebounds and passed former teammate Shawn Marion for 15th on the all-time career rebounding list. On December 23, Nowitzki moved past Shaquille O'Neal into sixth place on the NBA's career scoring list, then made the go-ahead basket with 19.2 seconds left in overtime to help the Mavericks defeat the Brooklyn Nets, 119–118. On February 21, he scored 18 points against the Philadelphia 76ers, becoming the sixth player in NBA history to reach 29,000 career points. 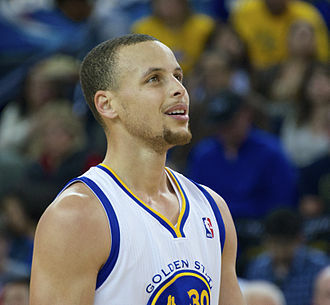 On March 20, he set a new season high with 40 points in a 132–120 overtime win over the Portland Trail Blazers. His 20th career 40-point game was his first since January 2014, and the first by a 37-year-old since Karl Malone in 2000–01. In Game 4 of the Mavericks' first-round playoff series against the Oklahoma City Thunder, Nowitzki passed Elgin Baylor (3,623 points) for 15th on the NBA's career playoff scoring list. The Mavericks lost the series four games to one. On July 27, 2016, Nowitzki re-signed with the Mavericks. Nowitzki missed several games early in the season with Achilles tendon problems. On March 7, 2017, in a 122–111 win over the Los Angeles Lakers, Nowitzki became the sixth player in NBA history to score 30,000 regular-season points. He also became the first international player to reach the milestone and one of only three to score all 30,000-plus with one team—the others being Karl Malone (Utah) and Kobe Bryant (Lakers). The Mavericks finished the season with a 33–49 record and missed the NBA Playoffs. Following the 2016–17 season, Nowitzki exercised his player option to become a free agent; this move allowed the Mavericks to re-sign him with less money and be able to pursue other free agents. On July 6, 2017, Nowitzki re-signed with the Mavericks on a two-year, $10 million contract (with a team option on the second year). On February 5, 2018, in a 104–101 loss to the Los Angeles Clippers, Nowitzki became the sixth player in NBA history to reach 50,000 career minutes. On February 28, 2018, in a 111–110 overtime loss to the Oklahoma City Thunder, Nowitzki reached 31,000 career points. On March 17, 2018, in a 114–106 loss to the Brooklyn Nets, Nowitzki played in his 1,463rd game, moving past Kevin Garnett into fifth place in the NBA career list. He had season-ending ankle surgery on April 5 after appearing in 77 of the first 78 games. The Mavericks finished the season with a 24–58 record and missed the NBA Playoffs. On July 23, 2018, Nowitzki re-signed with the Mavericks for the 2018–19 season. With his season debut on December 13, 2018, he set the NBA record for the most seasons played with the same team (21), breaking a tie with Kobe Bryant, who spent 20 seasons with the Lakers. He also became the fifth player in NBA history to play 21 seasons, tying an NBA record. Nowitzki was named to his 14th All-Star game as a special team roster addition. On March 18, 2019, Nowitzki became the sixth-highest scoring player of all time, surpassing Wilt Chamberlain's 31,419 points in a loss to the New Orleans Pelicans. In his team's final home game of the season, a 120–109 victory over the Phoenix Suns on April 9, Nowitzki scored 30 points, and announced his retirement. One day later, he played his final NBA game, recording a double-double with 20 points and 10 rebounds in a 105–94 loss to the Spurs. Nowitzki began playing for the German national basketball team in 1997. In his debut tournament, the EuroBasket 1999, the 21-year-old rookie emerged as the main German scorer, but Germany finished seventh and failed to qualify for the 2000 Olympic Games. In the EuroBasket 2001, Nowitzki was top scorer with 28.7 points per game, and narrowly lost the MVP vote to Serbian player Peja Stojaković. Germany reached the semi-finals and were close to beating host nation Turkey, but Hedo Türkoğlu hit a three-point buzzer beater to tie it, and the Turks eventually won in overtime. Germany then lost, 99–90, against Spain, and did not win a medal. However, with averages of 28.7 points and 9.1 rebounds, Nowitzki led the tournament in both statistics, and was voted to the All-Star team. Back home, the German basketball team attracted up to 3.7 million television viewers, a German basketball record at the time. Nowitzki earned his first medal when he led Germany to a bronze medal in the 2002 FIBA World Championship. In the quarter-finals against the Pau Gasol-led Spain, Spain was up 52–46 after three-quarters, but then Nowitzki scored 10 points in the last quarter and led Germany to a 70–62 win. In the semi-finals, his team played against the Argentinian team led by Manu Ginóbili, but despite leading, 74–69, four minutes from the end and despite Argentina losing Ginobili to a foot injury, the South Americans won, 86–80. However, the Germans won 117–94 against New Zealand in the consolation finals and won bronze, and Nowitzki, as the tournament's top scorer, (24.0 points per game), was elected the tournament MVP. Back in Germany, over four million television viewers followed the games, an all-time record in German basketball history. The EuroBasket 2003 proved to be a major disappointment for Nowitzki and his German squad. In a preparation game, he suffered a foot injury after a collision with French player Florent Piétrus; as a result, Nowitzki played inconsistently and was also often target of hard fouls. In the decisive second-round match against Italy (only the winner was allowed to play the medal round), Germany lost, 86–84, finished ninth and did not qualify for the 2004 Olympic Games. Nowitzki scored 22.5 points per game (third overall), but in general seemed to lack focus and dominance due to his injury. In the EuroBasket 2005, Nowitzki came back strong. He surprisingly led a depleted German squad into the Finals, beating title favorites Slovenia in the quarter-finals and Spain in the semi-finals on the way. EuroBasket pundits praised Nowitzki in both matches: against Slovenia (76–62), the forward scored a game-high 22 points and commented: "The Slovenians underestimated us. They said we were the team they wanted and that was wrong, you shouldn't do that in the quarter-finals." Against Spain (74–73), Nowitzki scored a game-high 27 points and scored the decisive basket: down by one and with only a few seconds to go, he drove on Spanish forward Jorge Garbajosa, and hit a baseline jump shot over Garbajosa's outstretched arms with 3.9 seconds to go. The German later commented: "It was indescribable. Garbajosa kind of pushed me towards the baseline so I just went with it." Despite losing the Finals, 78–62, to the Greeks, Nowitzki was the tournament's leading scorer (26.1 per game), and second-leading rebounder (10.6 per game), and shot blocker (1.9 per game), and he was also voted the Most Valuable Player of the tournament. When he was subbed out towards the end of the final, Nowitzki received standing ovation from the crowd, which he later recalled as "one of the best moments of [his] career". The German team was awarded a silver medal. In the 2006 FIBA World Championship, Nowitzki led the German team to an eighth place and commented: "It's tough luck. But overall, finishing eighth in the world is not bad." In the EuroBasket 2007, in which the top three teams automatically qualified for the 2008 Olympics, Nowitzki led Germany to a fifth place. He was the leading scorer with 24.0 points per game. The fifth place meant that Germany fell short of direct qualification, but was allowed to participate in the 2008 Olympic Qualifying Tournament. Nowitzki led Germany into a decisive match against Puerto Rico for the last remaining slot. In that crucial match, he scored a game-high 32 points and was vital for the 96–82 win which sent the German basketball team to their first Olympics since the 1992 Summer Olympics. Nowitzki was chosen to be the flag bearer for the German Olympic Team at the Opening Ceremony for the 2008 Olympics. Nowitzki led the German team to a tenth-place finish, and averaged 17.0 points and 8.4 rebounds for the tournament. In 2009, Nowitzki skipped the EuroBasket 2009. In July 2010, he said that he would skip the 2010 FIBA World Championship. 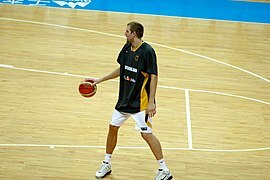 In summer 2011, Nowitzki played with Germany in the EuroBasket 2011, where the team reached ninth place. In 2015, Nowitzki captained Germany at the EuroBasket. They won only one game, and were eliminated in the group stage, on home soil. In January 2016, Nowitzki officially announced his retirement from Germany's national team. In his career with Germany's senior men's national team, he averaged 19.7 points, 7.5 rebounds, and 1.6 assists per game. Nowitzki was named the Euroscar European Basketball Player of the Year by the Italian sports newspaper Gazzetta dello Sport for five years running from 2002 to 2006 and again in 2011. He was also named the Mister Europa European Player of the Year by the Italian sports magazine Superbasket in 2005, and the FIBA Europe Men's Player of the Year twice in 2005 and 2011. Nowitzki was a versatile frontcourt player who mostly played the power forward position, but also played center and small forward in his career. An exceptional shooter for his size, Nowitzki made 88% of his free throws, nearly 50% of his field goal attempts and nearly 40% of his 3-point shots, and won the 2006 NBA All-Star Three-Point Shootout competition. In the 2006–07 season, Nowitzki became only the fifth member of the NBA's 50–40–90 Club for players who shot 50% or better from the field, 40% or better on three-pointers, and 90% or better on free-throws in a single season while achieving the NBA league minimum number of makes in each category. Nowitzki's shooting accuracy, combined with his long seven-foot frame and unique shooting mechanics (such as having a release point above his head), made his jump shots difficult to contest. Before the start of the 2011 NBA Finals, LeBron James called Nowitzki's one-legged fadeaway the second most unstoppable move ever, behind only Kareem Abdul-Jabbar's skyhook. Additionally, Nowitzki could drive to the basket from the perimeter like few men his size were able to do. NBA.com lauded his versatility by stating: "The 7–0 forward who at times mans the pivot can strike fear in an opponent when he corrals a rebound and leads the break or prepares to launch a three-point bomb." Charles Barkley said the best way to guard Nowitzki was to "get a cigarette and a blindfold". Later on in his career, Nowitzki also developed an unorthodox post-up game, often backing down his opponents from the free throw line or near the middle of the key, opening up the floor for multiple passing angles should a double team come his way. Nowitzki was the sixth player in NBA history, and the first European, to hit the 30,000-point milestone. Apart from being the Mavericks' all-time leader in points, rebounds, field goals, field goal attempts, 3-pointers, 3-point attempts, blocks, free throws, and free-throw attempts, Nowitzki made the NBA All-Star games fourteen times and the All-NBA Teams twelve times. 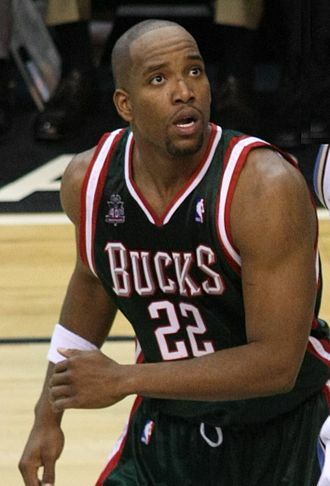 He was voted NBA MVP of the 2006–07 NBA season, becoming the first European player to receive the honor, as well as the MVP of the 2011 NBA Finals. Other achievements include winning the 2006 NBA All-Star Three-Point Shootout and the 2017 NBA Teammate of the Year award, being voted European Basketballer of the Year five times in a row by La Gazzetta dello Sport, and being the leading scorer and MVP of the 2002 FIBA World Championship, and EuroBasket 2005 tournaments. Nowitzki is the only player to record at least 31,000 points, 10,000 rebounds, 3,000 assists, 1,000 steals, 1,000 blocks and 1,000 three-point field goals. Nowitzki's older sister, Silke Nowitzki, described Nowitzki as a confident but low-key character, unspoiled by money and fame. He enjoys reading and playing the saxophone. Nowitzki passed his Abitur examination at Röntgen Gymnasium Grammar School of Würzburg. He founded the Dirk Nowitzki Foundation, a charity which aims at fighting poverty in Africa. Nowitzki dated Sybille Gerer, a female basketball player from his local club DJK Würzburg. The relationship started in 1992 and lasted for 10 years before it ended; Nowitzki said, "At the end, we found out we developed in separate ways. ... It did not work anymore, but we are still good friends." He added: "I surely want to start a family and have kids, but I cannot imagine it happening before I become 30." In 2010, Nowitzki met and began dating Jessica Olsson, sister of twin Swedish footballers Martin Olsson and Marcus Olsson. The couple got married on July 20, 2012, at Nowitzki's home in Dallas. They have a daughter, born in July 2013 and two sons, born in March 2015 and November 2016. Though Nowitzki has considered acquiring U.S. citizenship, he remains a German national. Nowitzki acknowledged close ties to his mentor Holger Geschwindner, whom he called his best friend. He is also good friends with his ex-teammate Steve Nash. Nash said of playing with Nowitzki, "We were both joining a new club, living in a new city, we were both single and outsiders: this creates a bond ... He made life easier for me and I for him ... Our friendship was something solid in a very volatile world." Nowitzki added, "He would have also become a good friend if we had met at the supermarket." Nowitzki's career has been chronicled in books. Dirk Nowitzki: German Wunderkind, written by German sports journalists Dino Reisner and Holger Sauer, was published in 2004 by CoPress Munich. The 160-page hardcover book follows Nowitzki's beginnings in his native Würzburg, documents his entry into and ascent within the NBA, and ends at the beginning of the 2004–05 NBA season. In November 2011, the Würzburg local newspaper Main-Post published a 216-page book written by its sports journalists Jürgen Höpfl and Fabian Frühwirth: Einfach Er – Dirk Nowitzki – Aus Würzburg an die Weltspitze, (Just Him – Dirk Nowitzki – From Würzburg to the top of the world). Both Höpfl and Frühwirth accompanied Nowitzki throughout his career, collecting interviews and photos used in the book. It looks back on the 2011 NBA Finals but also has a strong focus on Nowitzki's relation to his hometown Würzburg and his career progression which began there. The book features insights from former coaches, family members, and friends. In 2014, the film documentary Nowitzki. The Perfect Shot was released, which retells Nowitzki's career and life. ^ a b c d e f g h i j k l m "Dirk Nowitzki stats, details, videos, and news". National Basketball Association. Retrieved March 5, 2017. ^ "Top 10 power forwards in NBA history". Fox Sports. Retrieved February 25, 2014. ^ "All-Time #NBArank: Duncan tops list of best power forwards ever". ESPN. Retrieved January 15, 2016. ^ "Who Has Made The Most NBA All-Star Game Appearances of All-Time". Fox Sports. 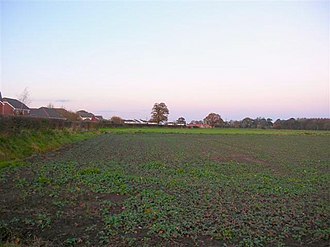 February 15, 2019. ^ a b By. "Mavericks re-sign 13-time all-star Dirk Nowitzki; set to break Kobe Bryant record". star-telegram. ^ "Nowitzki highest-scoring player born outside U.S." NBA.com. ^ Volpe, Conor. "Ranking the Best Seasons of Dirk Nowitzki's Career". Bleacher Report. ^ "Dirk Nowitzki to get Naismith Legacy Award". ESPN. October 20, 2012. Retrieved February 6, 2014. ^ "All Time Leaders". NBA Stats. ^ "1998 NBA Draft Flashback: Bucks trade Dirk to Mavs for Tractor Traylor, Mavs also trade for Steve Nash, many takes ensue". January 5, 2017. ^ "Suns Sign Steve Nash". Phoenix Suns. Retrieved January 21, 2019. ^ "Nash wins MVP award for second straight year". ESPN. May 7, 2006. Retrieved January 21, 2019. ^ "Nelson resigns; Avery takes over Mavericks". ESPN. March 19, 2005. Retrieved January 21, 2019. ^ "Amnesty day: Mavs waive Finley". ESPN. August 15, 2005. Retrieved January 21, 2019. ^ "Dirk Nowitzki Wins 2006–07 MVP Award". National Basketball Association. May 15, 2007. Retrieved March 5, 2017. ^ "Mavs get Chandler from Cats in 5-player deal". ESPN.com. July 13, 2010. ^ Ziller, Tom (June 12, 2011). "Dirk Nowitzki Named 2011 NBA Finals MVP After Mavericks Beat Heat For Championship". SBNation.com. ^ Dwyer, Kelly (October 14, 2011). "Dirk Nowitzki's knee surgery will keep him out six weeks, and it was a long time coming". Yahoo!. Retrieved January 21, 2013. ^ "Dirk Nowitzki is back". ESPN. December 23, 2012. ^ ""Beard Pact" more than fun and games". Mavs Moneyball. February 7, 2013. Retrieved February 25, 2014. ^ "Mavericks at Hornets – April 14, 2013 – Game Preview, Play by Play, Scores and Recap on". National Basketball Association. April 14, 2013. Retrieved February 25, 2014. ^ "Notebook: Rockets 117, Mavericks 115". National Basketball Association. January 29, 2014. Retrieved February 25, 2014. ^ "NBA History – Points Leaders". ESPN. Retrieved March 12, 2014. ^ "NBA History – Points Leaders". ESPN. Retrieved April 2, 2014. ^ "Mavericks Re-sign Dirk Nowitzki – The Official Site of the Dallas Mavericks". Mavs.com. July 15, 2014. Retrieved March 5, 2017. ^ "Cavs Sign Forward Shawn Marion". National Basketball Association. September 9, 2014. Retrieved September 9, 2014. ^ "Nowitzki, Mavericks rally past Kings 106–98". National Basketball Association. November 11, 2014. Retrieved November 12, 2014. ^ "Mavericks cruise past Hornets 107–80". National Basketball Association. November 17, 2014. Retrieved November 17, 2014. ^ "Rondo, Nowitzki carry Mavs past Lakers, 102–98". National Basketball Association. December 26, 2014. Retrieved December 28, 2014. ^ "Dirk moves up NBA scoring list, Mavs beat Nets 96–88 in OT". National Basketball Association. January 5, 2015. Retrieved January 5, 2015. ^ "Ellis has 38 points, Mavericks rally to beat Spurs 101–94". National Basketball Association. March 24, 2015. Retrieved March 24, 2015. ^ "Mavs beat Thunder 135–131 despite Westbrook triple-double". National Basketball Association. April 1, 2015. Retrieved April 1, 2015. ^ "Mavericks top Clippers 118–108 in Jordan's return to Dallas". National Basketball Association. November 11, 2015. Retrieved November 11, 2015. ^ "Nowitzki passes Shaq, helps Mavs pull out OT win over Nets". National Basketball Association. December 23, 2015. Retrieved December 23, 2015. ^ Devine, Dan (December 23, 2015). "Dirk passes Shaq for 6th place on NBA's all-time scoring list". Yahoo!. Retrieved December 23, 2015. ^ "Nowitzki, Williams lead Mavericks past Trail Blazers 132–120". National Basketball Association. March 20, 2016. Retrieved March 20, 2016. ^ "Thunder beat Mavericks 119–108 for 3–1 lead in testy series". National Basketball Association. April 23, 2016. Retrieved April 24, 2016. ^ "2016 NBA Western Conference Finals - Oklahoma City Thunder vs. Golden State Warriors". Basketball-Reference.com. ^ "Mavs re-sign 13-time All-Star Dirk Nowitzki". Mavs.com. July 27, 2016. Retrieved July 27, 2016. ^ "Clippers rout Mavs 124–104 in matchup of best, worst records". ESPN. November 23, 2016. Retrieved November 24, 2016. ^ "Dirk Nowitzki 2016–17 Game Log". Basketball-Reference.com. Retrieved November 24, 2016. ^ "Nowitzki tops 30,000 points, Mavs roll past Lakers, 122–111". ESPN. March 7, 2017. Retrieved March 8, 2017. ^ "2016-17 NBA Standings". Basketball-Reference.com. ^ "Dirk Nowitzki will reportedly take a massive pay cut to re-sign with Mavericks". SBNation.com. July 6, 2017. ^ Zucker, Joseph. "Dirk Nowitzki, Mavericks Agree to 2-Year, $10 Million Contract". BleacherReport.com. Retrieved October 19, 2017. ^ "Clippers score last 13 points, rally past Mavericks 104–101". ESPN. February 5, 2018. Retrieved February 6, 2018. ^ "Westbrook scores 30, Thunder beat Mavericks 111–110 in OT". ESPN. February 28, 2018. Retrieved February 28, 2018. ^ "Nets blow double-digit lead, still beat Mavs 114–106". ESPN. March 17, 2018. Retrieved March 18, 2018. ^ Sefko, Eddie (April 5, 2018). "Dirk Nowitzki has ankle surgery, will miss Mavericks' final games". The Dallas Morning News. Retrieved April 5, 2018. ^ "2017-18 NBA Standings". Basketball-Reference.com. ^ "Mavericks sign forward Dirk Nowitzki for NBA-record 21st season with same franchise". mavs.com. July 23, 2018. Retrieved July 23, 2018. ^ Price, Dwaine (July 23, 2018). "Nowitzki signs a one-year free agent contract with the Mavericks". mavs.com. Retrieved July 23, 2018. ^ "Dirk Nowitzki finally debuts, not quite up to 'NBA speed' yet". ESPN. Retrieved December 14, 2018. ^ MacMahon, Tim (March 18, 2019). "Dirk passes Wilt as NBA's 6th all-time scorer". ESPN. Retrieved March 18, 2019. ^ MacMahon, Tim (April 10, 2019). "Dirk stars for Mavs, makes retirement official". ESPN. Retrieved April 10, 2019. ^ "Spurs beat Mavs 105-94 in Nowitzki's final game". ESPN. Retrieved April 11, 2019. ^ "Dirk Nowitzki profile, World Championship for Men 2002". FIBA.COM. Retrieved January 21, 2019. ^ "Dirk Nowitzki profile, EuroBasket 2005". FIBA.COM. Retrieved January 21, 2019. ^ "Dirk Nowitzki officially retires from Germany's national team". sports.yahoo.com. ^ "Dirk Nowitzki profile, Olympic Games: Tournament Men 2008". FIBA.COM. Retrieved January 21, 2019. ^ Basketball star Nowitzki to carry German Olympic flag[permanent dead link], Yahoo! News, August 6, 2008. Retrieved August 7, 2008. ^ "Spain Survive Germany Surge To Go To Lille". FIBA. Archived from the original on September 12, 2015. Retrieved September 10, 2015. ^ Dan Devine (January 25, 2016). "Dirk Nowitzki officially retires from Germany's national team". Yahoo!. Retrieved March 5, 2017. ^ "Dallas Mavericks: Dirk Nowitzki retires from German national team". Sports Illustrated. January 24, 2016. Retrieved March 5, 2017. ^ "Players". Archive.fiba.com. Retrieved March 5, 2017. ^ Dirk Nowitzki named Europlayer of the year – Dallas Mavericks Blog – ESPN Dallas. ESPN. Retrieved August 10, 2012. ^ "LeBron: Dirk's Fadeaway 2nd Most Unstoppable Shot Ever". SLAMonline. May 30, 2011. Retrieved February 25, 2014. ^ "Dirk: 10,000 rebounds 'pretty unbelievable'". ESPN. Retrieved March 25, 2015. ^ "Dirk Nowitzki Game Finder". Basketball-Reference.com. Retrieved March 5, 2017. ^ "NBA All-Star Shooting Stars Winners". National Basketball Association. August 24, 2017. Archived from the original on February 24, 2018. ^ "NBA Milestone Watch: Defensive Rebounds". Basketball-Reference.com. January 1, 1970. Retrieved March 5, 2017. ^ "NBA Career Finals Leaders and Records for Free Throw Pct". basketball-reference.com. Retrieved January 15, 2016. ^ "Nowitzki verwandelt 72. Freiwurf in Folge (German)". t-online.de. Retrieved January 27, 2017. ^ "Dirk Nowitzki: Wieder neuer Freiwurf-Rekord (German)". focus.de. Archived from the original on April 19, 2016. Retrieved January 27, 2017. ^ "Player Season Finder". Basketball-Reference.com. January 1, 1970. Retrieved March 5, 2017. ^ Dirk Nowitzki Stats. ESPN NBA. Retrieved March 27, 2015. ^ NBA & ABA Single Season Playoff Leaders and Records for Free Throws. Basketball-Reference.com. Retrieved August 10, 2012. ^ Dallas Mavericks Career Leaders. Basketball-Reference.com. Retrieved January 9, 2019. ^ Sportler des Jahres: Mannschaften des Jahres seit 1947 Archived January 1, 2013, at the Wayback Machine. Sportler-des-jahres.de. Retrieved August 10, 2012. ^ (in German) Basketballer des Jahres – Wikipedia. De.wikipedia.org (July 30, 2012). Retrieved August 10, 2012. ^ Dirk Nowitzki named winner of the 2013–14 Magic Johnson Award. Probasketballwriters.org. Retrieved April 25, 2014. ^ "Dirk Nowitzki married in Dallas". espn.go.com/dallas. ESPN. August 9, 2012. ^ "The Dallas Morning News | Options". The Dallas Morning News. Retrieved February 25, 2014. ^ "Congrats, Dirk: It's a boy". ESPN. March 24, 2015. ^ "German basketball star Nowitzki hints at US passport bid | DW.COM | 10.01.2012". Deutsche Welle. April 16, 2015. Retrieved March 5, 2017. ^ "Einfach Er – Das Buch über Dirk Nowitzki" [Just Him – The Book About Dirk Nowitzki]. Einfach-er.de (in German). Retrieved August 10, 2012. Wikimedia Commons has media related to Dirk Nowitzki. The German national basketball team for men is the basketball side that represents Germany in international competitions. It is organized and run by the German Basketball Federation, the team is the successor of the West Germany national basketball team, the basketball side that represented West Germany in international competition. Between 1955 and 1973, Germany temporarily competed with an East German national basketball team as well, the first German presence in the European basketball championships was at EuroBasket 1951 in Paris. West Germany finished the round with a 1–2 record, third place in their group. They were again 1–2 in the first classification round, but this combined with a three-way tie-breaker put them second in that group and they lost the classification 9–12 and 11/12 games to finish 12th place of 18 teams. West Germany competed again at the EuroBasket 1953 in Moscow and their 1–2 record in preliminary pool play put them third in their four-team group, relegating them to the classification rounds. In the first round, they again took 3rd of 4 with a 1–2 record and they beat Lebanon 58–56 in the 13–16 semifinals to advance to the 13/14 game, in which they were defeated by Romania. 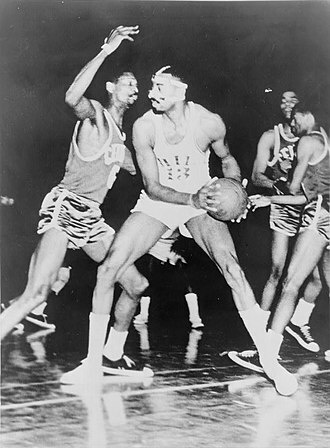 At the EuroBasket 1955 in Budapest, West Germany again was 1–2 in the preliminary round and their final game was a match-up against Denmark for 17th place, which West Germany won 51–49. West Germany competed in Sofia for the EuroBasket 1957 and they had no success in the preliminary round, losing all three decisions. They were relegated to the round, in which they were able to gather a few victories. They finished the round in the position at 3–4, taking 13th place overall. At the EuroBasket 1959, East Germanys national basketball team entered the tournament when their counterpart from West Germany did not qualify, East Germanys team only qualified for the EuroBasket five times. Ironically, they finished better than West Germany every time, until the German reunification in 1990, the team played as the West Germany national basketball team. It was held in Serbia and Montenegro between 16 September and 25 September 2005. Sixteen national teams entered the event under the auspices of FIBA Europe, the cities of Belgrade, Novi Sad, Podgorica and Vršac hosted the tournament. It was the time that the championship was hosted by the city of Belgrade. Greece won its second FIBA European title by defeating Germany with a 78–62 score in the final, germanys Dirk Nowitzki was voted the tournaments MVP. Belgrade, the capital of Serbia and Montenegro, was the stage of the EuroBasket 2005 action. The Pionir Hall hosted Group Cs six preliminary games, while the Belgrade Arena hosted the competition following the preliminary round. This was the time that championship was hosted by the city of Belgrade. Belgrade previously hosted the European basketball championships in 1961 and 1975, podgoricas Morača Sports Center hosted Group B, where six games were played. Being in Montenegro, it is the farthest locale from the central venue, Novi Sad, nicknamed The City of Sports, is the capital of province of Vojvodina and home to the Spens Sports Center. The six Group D games were played there, Vršac was home to Group A during the tournament, and had a total of six games played in the 5, 000-person capacity Millennium Center. Of the sixteen teams participated in EuroBasket 2005, hosts Serbia and Montenegro the top four teams from EuroBasket 2003, Spain, Italy. Greece took the place of the French team, which was the team in EuroBasket 2003. The other eleven teams earned their berths via a qualifying tournament, the teams were split in four groups of four teams each where they played a round robin. The first team from each group qualified directly to the knockout stage, to define the other four teams that advanced to the knockout stage and third-placed teams from each group where cross-paired and the winner from each match advanced to the quarterfinals. In the knockout quarterfinals, the winners advanced to the semifinals, the winners from the semifinals competed for the championship in the final, while the losing teams play a consolation game for the third place. Nikos Galis was the top scorer in 1986. Dirk Nowitzki was the top scorer in 2002. Yao Ming was the top scorer in 2006. J. J. Barea was the top scorer in 2014. Lithuanian center Arvydas Sabonis won six Euroscar Awards between 1984 and 1999. Dirk Nowitzki was the German League's Top Scorer, in 1999. Chris Copeland was the German League's Top Scorer, in 2010. Terry Schofield was the German League's Top Scorer, in 1974. Dirk Nowitzki won the FIBA Europe Player of the Year award 2 times (2005, 2011). Andrei Kirilenko won the FIBA Europe Player of the Year award 2 times (2007, 2012). Pau Gasol (center) won the FIBA Europe Player of the Year award 2 times (2008, 2009). Malcolm Delaney won the Basketball Bundesliga MVP award in 2014.